Transport Hi-Tech Consultants (THTC), a leading technology firm in the Middle East will be participating among the 150+ exhibitors in this year’s Gulf Traffic, the region’s largest traffic and transport technology exhibition. This three-day event will be held on December 4-6, 2018 at Zabeel Hall 1 & 2, Dubai World Trade Centre. “Our key objective for our participation at the Gulf Traffic is to showcase our robust and innovative solutions to help in solving city mobility problems and achieve a more efficient traffic management in every city in the region,” said Dr. Saad A. AlMubayedh, Founder and CEO of THTC. THTC has created leading solutions in the areas of Navigation, Smart Mobility, and ITS that have improved the mobility of road users like Smart Drive App, Delilat Arriyadh App, EPM Traffic, Madinatak and Smart Taxi Solutions. 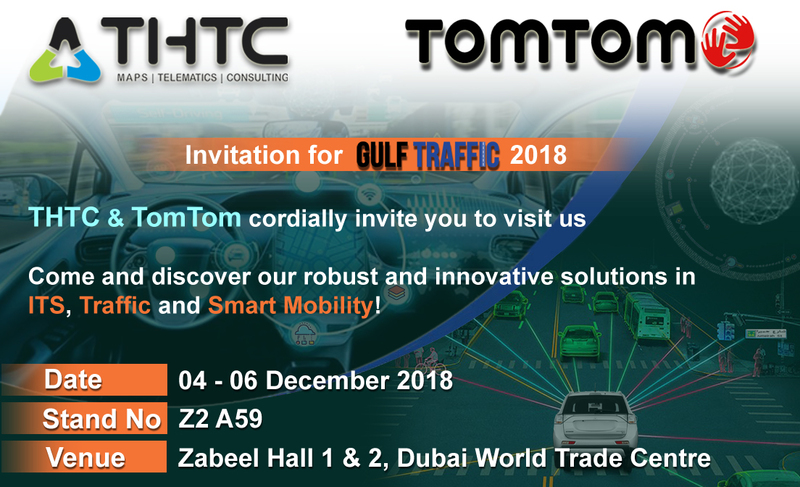 You can visit THTC and TomTom at Stand No. Z2 A59 to see the demonstrations of their live traffic solutions and other smart mobility applications. THTC’s representatives will be available for inquiries and presentations throughout the exhibition. For further details, call THTC at +971 4 454 7174 or visit their website at www.thtc.ae.